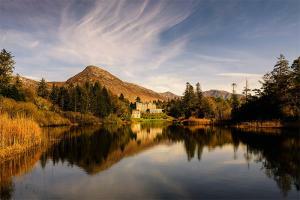 Set in a private 450 acre estate of woodland, rivers and walks in the rugged heart of Connemara, this authentic and unpretentious castle hotel proudly stands against the backdrop of the beautiful 12 Bens Mountain range. The hotel comprises 48 guest rooms, of which nearly half are classic rooms situated in the older part of the castle, and two riverside wings featuring superior rooms and luxury rooms and suites. Located along the Wild Atlantic Way, on private 450 acre estate of woodland, rivers and walks in the heart of Connemara Co. Galway. Just 31 miles from the Connemara Airport.